Accumulator Head and Reciprocating Screw are both types of Intermittent Extrusion Blow Molding. In this method, the extruder moves backward and forward similar to an injection molder. 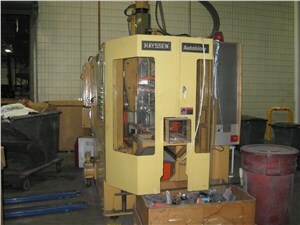 The molds are located under the die head remain in the same place and open and close. Intermittent Extrusion machines are very fast cycle times are possible. They typically run HDPE resin. Accumulator Machines are actually a reciprocating screw with a larger shot size. In order for the shot to be larger, the extruder allow the plastic to “accumulate” before it is shot into the mold. Shot sizes for Accumulator heads usually range from three to 75 lbsTypical applications for accumulator blow molding machines include automotive panels, industrial containers, and large housewares items.